If Les Paul had only invented the solid-body guitar that bears his name, he’d be rock royalty. As an icon, the Gibson Les Paul has few peers. But, Paul also transformed the reel-to-reel given to him by Bing Crosby into the first functioning multitrack recording machine. That innovation in the mid-’40s spurred the development over the next 10-15 years of two-, three-, four-, and eight-track recorders. Oh, and Les was a pretty fair jazz guitarist. All things considered, Les Paul leaves this world at the age of 94 with one of American music’s most towering resumes. To honor his memory, here’s my favorite song featuring a Les Paul reference. Following Paul to the great gig in the sky is Memphis producer Jim Dickinson. A maverick badass, Dickinson was the punk rock Jerry Wexler. He worked with the Stones on Sticky Fingers, recorded Big Star’s Third/Sister Lovers, recorded the Mats’ Pleased To Meet Me, played with Dylan, sired the North Mississippi All-Stars, and embraced a punk rock work ethic pretty much from day one. He could’ve sold out, but didn’t. He could’ve moved anywhere, but stayed in Memphis. His appreciation for the old-school R&B and country rhythm section is gospel on the Adios Lounge. All good things come from the pocket. The pocket is holy. Jim Dickinson understood that implicitly. Today, we lost one of the good ones. Radio listeners within earshot of Mississippi Public Radio will miss Jim Dickinson's Saturday night appearances on Thacker Mountain Radio. Jim and his band, The Yallo Bushwackers were the house band on the show's eclectic mix of author and poet readings, musicians and host, Jim Dees, edgy comments. One show from a couple of years ago is quite memorable. 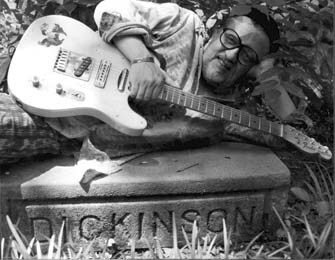 The entire hour was devoted to Dickinson remembering and playing through his entire music career. That's a Thacker Mountain Radio show I would love to have in digital listening format. Thanks for writing, Edge. I'll try to keep a look out for some good Dickinson pieces as they start to trickle in and post them here. Any other interesting JD stories out there? Feel free to post. I'm sure there's millions.